Tech Support Self Help - How do I cancel an event? 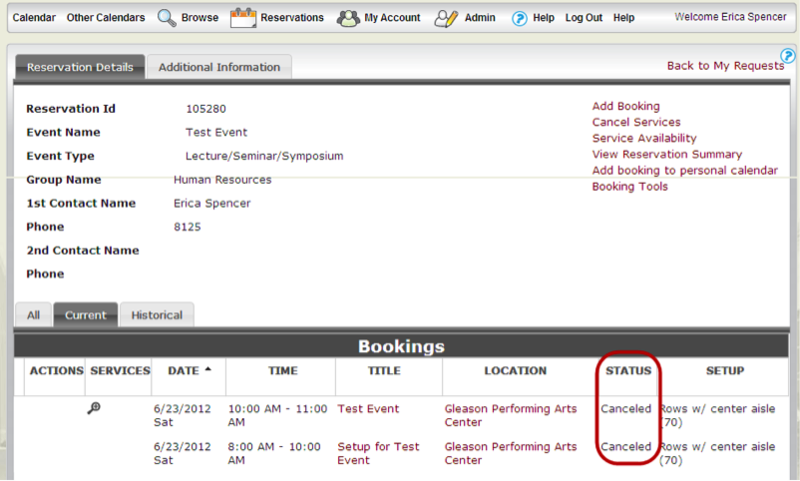 The process for canceling an event is determine if an event is an on-campus or off-campus event. 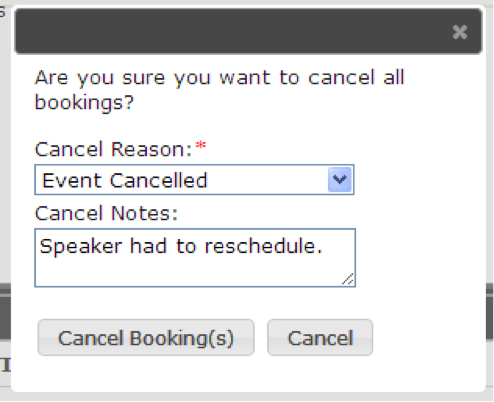 To cancel an event, choose Reservations, then View My Requests. From the list of all event requests you have made, choose the one you would like to cancel, and then click on the Name of the event (red link). You will be prompted to choose a cancel reason and enter any notes about the cancellation. Then click the Cancel Booking(s) button. You will see a pop-up confirming that all booking were successfully cancelled. On the Reservation Details, you will now see that the status of the event has changed to Cancelled. Select "My Options", then "View My Requests." Click the event you wish to add information. Click Cancel Event. A message opens asking you if you are sure that you want to cancel all the selected event dates. The Event Summary page is updated to reflect the cancellation of the event dates. None of the entries are removed from the Event Summary page. Instead, a single line runs through each event date, indicating that it was cancelled. For any questions, please contact Tech Support at techsupport@fit.edu or (321)674-7284.